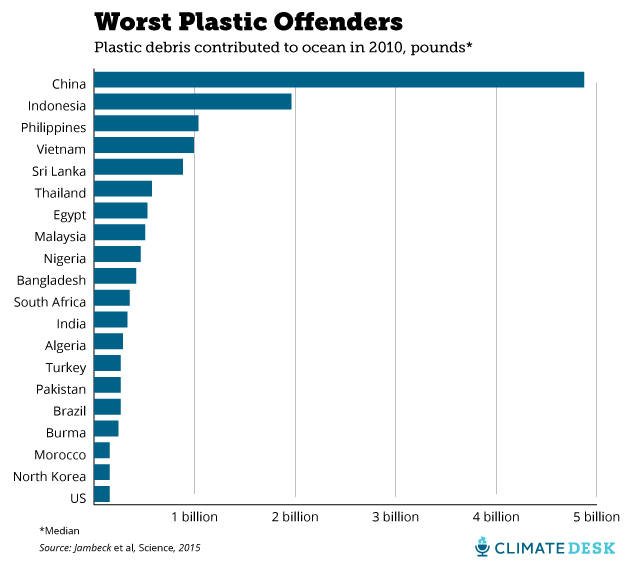 Plastic Soup News: There's a Horrifying Amount of Plastic in the Ocean. This Chart Shows Who's to Blame. There's a Horrifying Amount of Plastic in the Ocean. This Chart Shows Who's to Blame. Marine scientists have long known that plastic pollution in the ocean is a huge problem. The most visible sign of it is the Great Pacific Garbage Patch, an accumulation of waste (actually spanning several distinct patches) floating in the ocean. It's at least twice the size of Texas and can be seen from space. This pollution has an incalculably lethal effect on everything from plankton to whales. So just how much plastic is there? A new study in Science yesterday put out some pretty horrifying numbers: In 2010, the study finds, between 4.8 and 12.7 million metric tons (that's about 10.5 billion to 28 billion pounds) of plastic entered the oceans—the median of those estimates is 1.3 times the weight of the Great Pyramid at Giza. If we want to crack down on all that plastic, knowing where it all comes from could be as important as knowing how much there is. That's the main idea behind this study. A team of scientists led by University of Georgia environmental engineer Jenna Jambeck set out to calculate how much plastic every one of the world's 192 coastal countries dumps into the ocean. 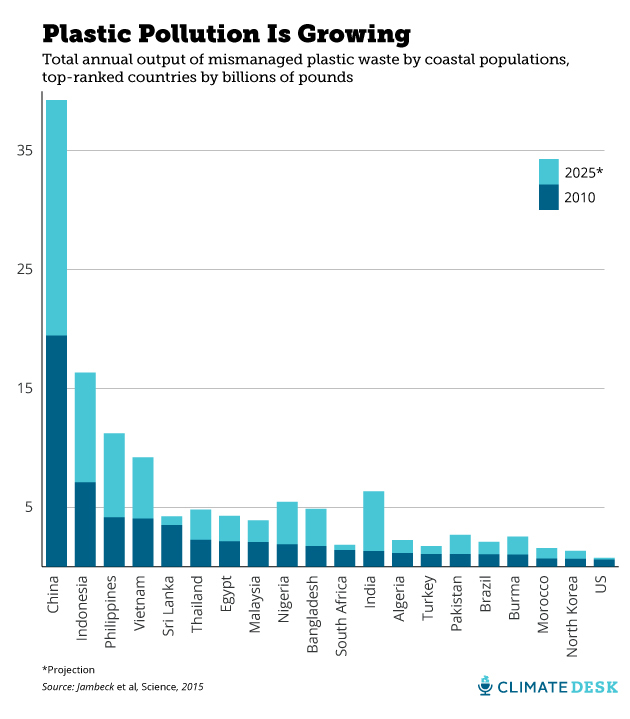 To do it, they combined data on each country's per-capita waste generation, the size of the population living within 50 kilometers of the ocean, the percentage of waste that is plastic, and the percentage of plastic waste that is "mismanaged" (defined as "either littered or inadequately disposed").